Brazil’s got no shortage of wild, extraordinary places, but even here, Paraty is unique. This town, on the Costa Verde between Rio and São Paulo, was a colonial-era gold-exporting center, and the churches and cobblestone streets from the 18th century still stand today, against a backdrop of verdant jungle. And if that’s not enough, it’s also got a bit of a Venice vibe — the original foundations were laid just below sea level, so its pedestrian-only town-center streets are occasionally subsumed by the tides. 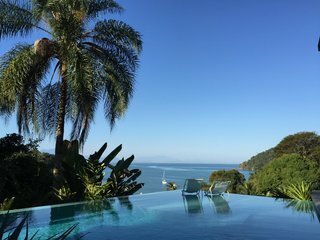 Casa Mar, thankfully, is elevated above a fishing village a few minutes’ drive up the coast from Paraty proper — in its case Casa Mar refers not to the ocean’s waters lapping at the house’s threshold, but to the expansive views of the island-dotted bay that lie just to the east. There’s not much to the house besides eight simple, quietly luxe coastal-chic contemporary rooms, a splendid infinity pool, and a little bar for the obligatory sunset cocktail. But what more could you possibly need? Just down the hill you’ve got access to a beautiful beach, with all the waterborne activities you could ask for, and from there it’s back up to Casa Mar for dinner — or a quick hop into town where you’ll have your pick of the local restaurants.